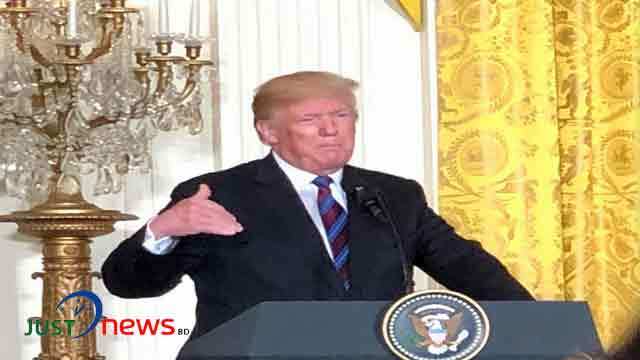 Washington, Apr 15 (Just News): President Donald J. Trump is joining with allies to call on Syria and Syria’s defenders to declare and dismantle Syria’s chemical weapons arsenal. The United States has issued clear warnings against the Assad regime’s chemical weapons attacks, and stated that we will not tolerate the continued use of chemical weapons. President Trump is continuing a course he set last year following years of failure under the previous administration’s approach of appeasement and cooperation. Comply with the de-escalation zones and ceasefires to allow humanitarian aid to reach civilians. A PATTERN OF HEINOUS CRIMES: The Assad regime’s April 7, 2018 use of chemical weapons is only the latest in Assad’s continued pattern of heinous aggression against his own people. The large amount of information about this attack clearly demonstrates Assad’s culpability for the April 7th chemical weapons attack in the Eastern Damascus suburb of Duma, which killed dozens and injured hundreds of civilians. A large volume of high-resolution, reliable photos and video from Duma clearly document victims suffering from asphyxiation and foaming at the mouth, with no visible signs of external wounds. Reliable intelligence indicates that Syrian military officials coordinated what appears to be the use of chlorine in Duma on April 7. Credible medical personnel and organizations have reported symptoms of chlorine and sarin. Eyewitness accounts report that an Mi-8 helicopter launched from a Syrian regime airfield was circling Duma at the time of the attack. Photos of barrel bombs dropped in Duma closely match those previously used by the Assad regime. Doctors and aid organizations on the ground in Duma reported the strong smell of chlorine and described symptoms consistent with exposure to sarin. There have been reports of 30 separate incidents of chemical weapons use since the United States’ April 7, 2017 strike in Syria in response to the regime’s use of sarin. In November 2017, the Assad regime conducted a sarin attack against its people. Assad uses chemical weapons in a manner to maximize suffering, such as against families huddled in underground shelters, as was seen in Duma. At the time of Assad’s chemical weapons attack in Duma, the population there was already negotiating for surrender and evacuation. A CADRE OF WILLING ENABLERS: Russia and Iran have contributed to the discord and chaos in Syria, providing a shelter for Assad to continue his terrible chemical weapons attacks. The Trump Administration has made it clear that Russia and Iran share responsibility for the brutal actions of the Assad regime. The United States will not be fooled by another Russian disinformation campaign trying to deflect the blame. Russian claims that Assad has eliminated his chemical weapons program are clearly untrue. Due to its inability - or refusal – to curb Assad’s crimes, Russia must assume responsibility for his behavior.